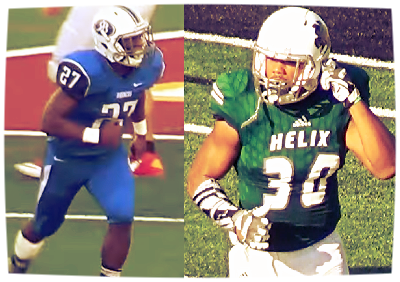 Running Back Milan Grice (Rancho Bernardo) and Linebacker Ezekiel Noa (Helix) hopes to led their team to San Diego Prep Football's most prestiges prize, the Open Division Championship. Here's a sneak peak of the opening round match-ups taking place this Friday night. The premier playoff bracket kicks off with a battle between champions of the toughest leagues in the San Diego Section. Winners of seven of its last eight outings since suffering a 31-0 upset loss to Sante Fe Christian, the new and improved Falcons will now face the tough task of trying to knock off their top-seeded and undefeated neighborhood rivals. While Torrey Pines leads the all-time series 11-9, Cathedral Catholic is 1-0 in Open Division playoff meetings after a 27-0 first round victory in 2014. Led by the outstanding play of senior quarterback Tate Haynes and all-purpose weapon Jordan Genmark-Heath, the Dons notched signature wins over Helix, St. Augustine, and Madison en route to a perfect regular season. Torrey Pines also boasts an impressive resume with key wins over Oceanside and Mission Hills. Going into the playoffs with two straight losses, Mission Hills will make its first-ever trip to Jack Mashin Stadium, where they'll be looking to advance to the Open Division semifinals for the fourth-straight season. Grossmont hopes to spoil the party in their Open Division debut, in front of what should be a packed home crowd. This will be the second-ever meeting between these schools, with the Grizzlies leading 1-0 after a 35-7 victory in 2009. Something will have to give this Friday. Oceanside currently has a streak of 22 consecutive semifinals appearances and 12 consecutive trips to the section final (both CIFSD records), while defending state champion Rancho Bernardo has the longest active winning streak in the county with 19 straight victories. This will only be the third meeting between the teams, with the Pirates owning a 2-0 advantage in a series that took place during the 1990 and 1991 seasons. If the Pirates hope to keep its streaks going, their defense need to find a way to contain a powerful ground attack that features Silver Pigskin finalist Milan Grice. The senior finished the regular season with 1241 yards rushing, 16 touchdown runs (18 total), and has rushed for over 100 yards in every game he played. Oceanside's offense will be led by senior quarterback Max Shuffer and his top target Jake Gerardi. The Highlanders have a shot at being San Diego's first back-to-back Open Division champions, but first they must survive a rematch from the final week of the regular-season, where they rolled to a 40-13 victory. Making its Open Division debut, Valhalla will need to pick up its first win over the Highlanders since 2009 in order to advance. The Norsemen started the season on a 6-0 tear before dropping their first loss of the season to Grossmont.